I tried this new RP almost a year earlier and was able to get through several turns before inactivity took its toll. I was thinking about bringing it back and because it's not a spore RP i figured i would place it here to open it up to more people. Here's the earlier thread i was talking about. There are several things i'm going to try different though. After years of separation and general destruction the human race has managed to unify under one general government known as the "Human Republic". But of course this was a huge undertaking and the general setup of the government is still under debate. Currently only one major organization, the Human Senate, has been created and the populace still needs to decide which representatives they wish to send to this new government. This is a truly open assembly. All former political parties are now powerless as their constituents now consist of the entire world rather than the country they were once limited to. It is the perfect time for new political policies to enter the playing field, a perfect time for taking power. -You are part of a small political party that has been behind the scenes for several years. Recently you were able to rise up the ladder and have been chosen to lead your party into new heights of power. -Create a party and a character that leads your party. There are five major classes that the population is split into. In order for your party to be successful you must really focus on only one of these classes rather than a generalization that attempts to cover all three. Population distribution will be posted later along with the percentage of wealth each class controls. Just remember this, even though the Upper Class has very small actual votes, they control a majority of the wealth. And even though the Lower Class has huge numbers (votes) at their disposal they hold little real value. It would not be wise to shun either of these parties exclusively. Lack of wealth or lack of votes can be a bad thing for a party's health. Choose the right balance. Party Leader: The name of your party leader. Leader Description: Any information you want to share about your party leader. General Information: General information about your party and anything else you want to add. -Each party is allowed to propose bills that will then be voted upon by everyone. There is a limit of only 1 bill on the voting floor at a time. Any more and it gets too hectic. -This new Human Senate has been created with only 500 seats allowed. Elections will be held periodically. -All sorts of diplomacy is allowed between parties and characters. It can be either up front or behind shady doors. Its up to the players. In the event of a proposal, each creator chooses which way their party votes. In general all of the senators follow exactly what the party leader says. So if you have control of 30 seats and you vote in favor of a bill, 30 votes will be added for that bill. 251/500 votes are needed for the passing of a bill. *This contains any changes mentioned by another party and agreed upon by the party proposing the bill. There can only be one change per bill announcement. Every once and a while (specific time period is not known at this point), there will be elections that determine the representatives to popularly elected government institutions (only the Human Senate at this point). Think of me as the public. 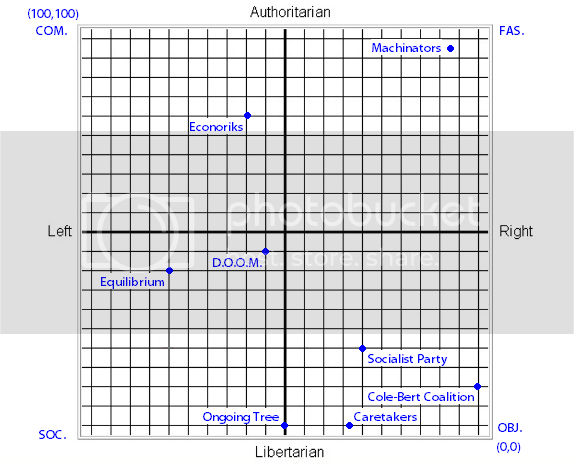 I will determine which votes go where which will put certain parties in power. Anything you want the public (me) to see post in one of these topics. If not, then keep information secret. Declarations my parties can either be positive or negative. Leader Description: Martin was born into a low-to-middle class family slightly over thirty-two years ago. He was an extremely successful man in school, and eventually the military of his country looked into recruiting him. He was almost totally shocked at how much money he had been offered to join the military, and quickly took it, mostly because he thought he could escape his ramshackle home. He developed weaponry technologies for a period of years, until he talked too much about his views on how things should be run in government. Someone very high level ended up hearing, and Martin was almost immediately out on the streets, lucky to not have been 'silenced'. After nearly seven years in the military, he could barely adjust to street life, usually unemployed, and almost homeless. However, one day Martin decided that he had enough, that he would succeed, and succeed in politics. He ran first for lower level positions, until eventually reaching the position of governor of his state. At that point, the Human Senate was formed. Martin, ever ambitious and intelligent, founded his own party made up of many poor followers that he had accumulated over the years. He called this party the Caretakers. He, and his followers, would represent the lesser peoples of the world. General Information: The Caretakers control a great mass of Lower Class citizens, usually utilizing their votes in often under-handed ways. However, they usually will not bend when it comes to increasing the prosperity of the Lower Class, even if it means redistributing the wealth from the Upper Class. They support a regulated economy which is mostly a free market, but know that deregulations leads to busts. There are also rumors of money coming from illegal operations, though no proof has ever been found of these. Leader Description: Vladimir Kirillov (known to members of his party as A-KIRILLOV) was born into an upperclass family in what is currently Russia, yet still had a rough childhood, primarily due to abusive parents. Inspired by the politics of his hero, Josef Antonov, he set out to create a system in which emotions no longer had any meaning. He sought to send society through a series of stages concluding with a stage in which humans would be radically different from what they are now- more efficent, but soulless. He tought himself to be charismatic in his early twenties- not because he actually found it an important skill for his beliefs, but because it increased the rate at which he gained followers. By the current time, he managed to make his party take up 15% of the world population, and nearly 70-80% of the Moscow area. As he has aged, he has replaced body part by body part with equivelent machine parts, trying to be ahead of them all. Actually, a bit under 20% of his body is no longer organic. Some others high in the party have acted similarly. General Information:The Machinators intend to send the human race through a series of stages. Though some levels of information of these stages are avaliable to the public, only those high in the party know of other details that are being laid out. This is the stage that the party is currently in. They are trying to become one of the two most populous parties. Their members are encouraged to reproduce, and in some cases even clone themselves. They are also encouraged to spread their beliefs to others. This stage is expected to last several decades to a century, if successful. In this stage, government policies would be reformed to remove choice from the individual and make the government slowly become more and more prominent until the individual has hardly any choice. This period is expected to last 1-3 centuries, if successful. In this stage, rebellions will truly be squashed. All humans will be part by part transformed into robots, including the government itself. Though at first it will seem as if everyone is becoming machines, it will be one large machine eventually, spanning the planet. This stage is expected to last 5 centuries to a millenium, if successful. Of course, the machine is trained to do something. It will slowly destroy everything organic about the earth, smashing nature and making the whole planet one, large computer system. This period is expected to last several milleniums, if successful. The machine will be programmed to determine how to spread to other planets. This stage will last for as long as the machine lasts. Eventually, the machine will spread across galaxies, cold, calculating, and ensuring that no aliens ever let emotion get in their way either. Pro-Corporations- but slowly, as the corporations grow fatter they will grow into the corporations, parasitically taking their assets and by the end of Stage 2 destroying them. Pro-public schools- they want to smash the private school. They only want one place to send children to educate them. Anti-net neutrality. Actually, scratch that. Just Anti-internet. They'd prefer to turn the damn thing off and replace it with a public government news network. Leader Description: Long hair, a "third-eye" tattoo, headband, rock music and silky clothing would be the main facets of Mr. Snoocherkat's appearance. He was born by a single hippy mother and quickly learned the ways of sharing and loving. He strongly believes that the middle class should be the only class existing, and therefore he tries to uplift lower class members, and eventually wants to abolish the upper class. About how many players until it starts? John Elder was born into a middle class family. He lived in a nice home and got good grades. His career path was medical, and for the final term of medical school, he went on a training trip with WorldWide Doctors(WWD) to Bolitis. The stunning poverty he saw there made him resolve to help people everywhere, so he dropped out of medical school a week before his finals and started a political party. Originally just him and a few friends discussing the world's problems in a smoky bar, it morphed into a social movement within his home country of Indetia. Gaining members by the thousands, the group's burst onto the political scene were two events that would shape the party forever. The first organized group effort was a massive fundraiser for aid and WWD to Bolitis. The party raised over a million dollars in grass-root funds, mostly from door-to-door and Internet donations. The money was sent to the masses in Bolitis, and several members who went there in later years saw their wealth distributed to the poor to start businesses, gain medical care and begin an education. Early videos were brought back, and among a night of partying and celebrations, John and his friends congratulated themselves for helping the world. The second event was a protest against the government of Indetia for cutting all aid to third world countries by 50% for budget cuts. The protest degenerated into a riot when the governor made a statement claiming that the countries didn't need the money anyways. Over the course of three days, five thousand Socialist Party members blew up several expensive cars, lit multiple sections of the luxury district downtown on fire, and severely beat several members of local law enforcement. Over a thousand party members were arrested the day after, John and his cohorts included. He served three years for arson, assault with a deadly weapon, aggravated assault, and inciting a riot. His sentence was lowered by the judge, who had said, "Your doing the right thing, just not in the right way." John served his sentence, but while in prison, he earned a degree in law and began reorganizing the party when he left prison. The movement went worldwide two years before the Human Republic, and now has roughly ten thousand volunteers and members. John is charsmatic, and intends to lead his party to the Senate. What are the party attitudes towards other parties? Shall I take the place of Stark Raving Loony? Why not? It's not a Communist party, but a Socialist one. That's only a regulated economy. There is a good chunk between 30% and 100%.